Leo Dunson is a Minister, Political Activist and decorated Iraq War Veteran. Leo frequently delivers speeches that are Politically charged supported by Biblical Doctrine. He studied political science at the University of Nevada Las Vegas. Leo Dunson has released a Political Hip Hop (Music Album) entitled “Freed From Mental Slavery,” a rap album about his struggles with breaking away from the traditional monolithic liberal Democrat thought patterns of Black America. 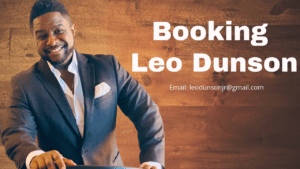 The Leo Dunson Podcast is available weekly on ITunes, Spotify and other Podcast platforms. Mr. Dunson has appeared on NRATV, CNN, Fox News, Huff Post, BreitBart, the Associated Press and many other major news media outlets. Leo Dunson went to basic training at Fort Benning, Georgia joining the U.S. Army in 2003. (BCT) consist of several weeks of intense training designed to hone your skills; teach you new skills, optimize your physical and mental performance. After (BCT) Dunson went to(AIT) briefly taught him what it would be like to be an infantry man. They briefly covered room clearing techniques (MOUT), a few Battle drills, individual Movements, a couple formations and a few more briefly covered Infantry tactics says Dunson. After AIT he was off to his Duty Station in Fort Wainwright, Alaska. Where he was placed in the 172nd Stryker Brigade Combat Team. 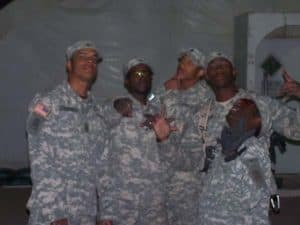 Dunson trained with his unit for a year and a half, before being deployed to Iraq in August 2005. The unit deployed to Mosul, Iraq. Duties of the unit during deployment included numerous patrol operations, searches for weapons caches, and counterinsurgency operations. Dunson was promoted to Sergeant in Country effective date 1 July 2006. The 172nd Stryker Brigade along with Dunsons’ tour was to have ended on 27 July 2006, but the U.S. Army unexpectedly extended the deployment until the end of November 2006. During the extension, the unit was sent to Baghdad to quell growing sectarian violence concerns. 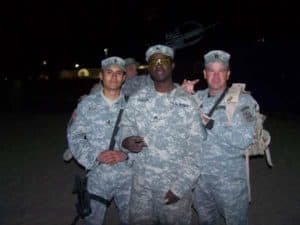 The infamous extension of the deployment had happened after some of the units of the Brigade were already touched down at their home base of Ft Wainwright, AK, forcing them to fly back to staging areas in Iraq. The extension occurred after the unit’s regular 12-month tour was complete, making the deployment last for a total of 16 months. As a result of the unit’s action in Iraq, the brigade was awarded the Valorous Unit Award. 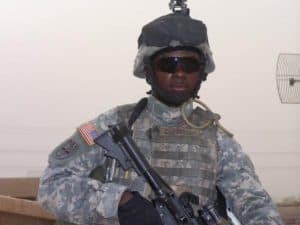 Dunson re-enlisted in Iraq completing his first full term of service. He also attended (WLC) previously called Professional Leadership Development Course (PLDC) in Fort Richardson, Alaska in September 2007. Dunson Honorably discharged out of the Military effective April 2008.